$8,500,000 THE WILEY HOUSE, 1950. ARCHITECT PHILIP JOHNSON. One of the stars of New Canaan's legacy of mid-century modernism, the Wiley House, designed by Philip Johnson in the early 1950's, was restored by Roger Ferris + Partners. 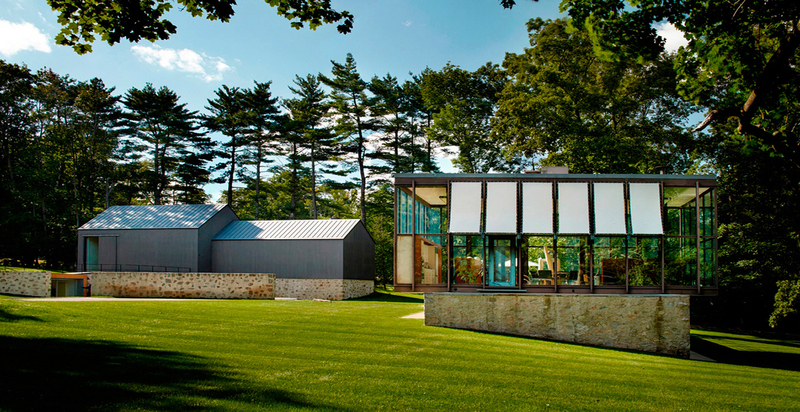 Johnson's double-height glass pavilion with its living room and subtly hidden but generous galley kitchen cantilevers out over the fieldstone base. The slope of the land allows the lower-level rooms with the light marble floors full views of the property. The vintage swimming pool with its original diving pad is a twin to the circular pool at Johnson's Glass House. A new pool house built into the hill and the reconstructed barn/art gallery form their own separate courtyard. A stand of towering Hickory trees creates a cathedral space around the house. BY THE NUMBERS: 4 BEDROOMS, 5 BATHRPPMS, 5,616 SQUARE FEET, 6.33 ACRES. Listing provided by Inger Stringfellow. Photography by Michael Biondo.